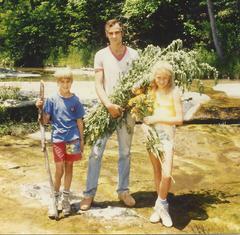 I was raised on a farm in the Ozark Hills of Missouri, in a beautiful valley. The Ozark region is one of the richest botanical regions in the world. Many of the most effective and popular herbs growing there are in their natural state. 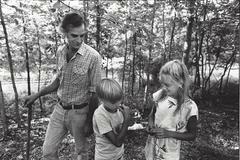 My father became a world renowned herbalist and manufacturer of highest quality herbal extracts, produced from herbs gathered in the wilderness that surrounded our farm and organically grown at our farm. Growing up, my family was able to treat most all of our childhood illnesses with the herbal remedies that my father created. In particular, they were able to avoid having to give us antibiotics for many of the childhood illness and we very rarely had to go to the doctor. After graduating from Arizona State University I stayed in the Phoenix area and started a family of my own. Herbal remedies remained the first order of defense for us. Something that was hard to ignore was the number of people that I talked to with chronic illnesses not only in Arizona, but throughout the country in epidemic proportions. I could see that people seldom got long-term relief from prescription or OTC remedies, and these often produce very undesirable side-effects as well that are sometimes just as bad if not worse than the initial condition. This became the inspiration for Desert Willow Botanicals – herbal formulas that are still produced from the highest quality organic or carefully wild-crafted herbs and that address some of the most common complaints and conditions that everyday people deal with. It’s a great feeling to know that I am doing something that I love and have a passion for along with seeing the end of suffering and amazing results that customers get from using my products. I’m proud to offer a 100% money back guarantee on all of my products. Why? Because they work! Contact me today for your free consultation! To your health, happiness and prosperity!